AFTER three years of staying below the radar following an appeal that ordered the Penang-based property developer to stop construction work on its maiden project in Bandar Tanjong Pinang, Penang, Ewein Bhd is all set to make a comeback. The group bounced back from last year’s fourth-quarter net loss of RM1.32 million to post a net profit of RM12.05 million in the first quarter of this year — more than quadrupling its prior-year total and surpassing the RM9.07 million net profit recorded for the whole of financial year ended Dec 31, 2017 (FY2017). 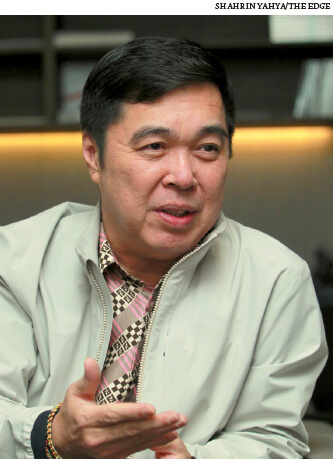 Deputy chairman and group managing director Datuk Ewe Swee Kheng tells The Edge that the group has weathered quite a storm over the past three years, and he believes the worst is over. The 50-year-old Ewe is upbeat on Ewein’s earnings performance for FY2018, which will see the group achieving a fresh record annual profit. The previous record net profit of RM11.52 million was set in FY2016. He says this will be mainly fuelled by revenue recognition from its City of Dreams development, which recently recommenced after the stop-work order was lifted. With a gross development value (GDV) of RM800 million, the project is being developed jointly by Ewein’s subsidiary Ewein Land Sdn Bhd and Consortium Zenith Construction Sdn Bhd (CZCSB) via the joint-venture (JV) vehicle Ewein Zenith Sdn Bhd. Ewein holds an 89% stake in Ewein Zenith, while CZCSB owns the remaining 11%. Ewe says the 3.67-acre City of Dreams project, launched in 2015, has seen about 70% of its 572 units taken up. Construction work on the two blocks of 38-storey sea-fronting serviced apartments is still on track to be completed by the end of next year. Revenue recognition from City of Dreams will continue until early 2020. By then, Ewein would have embarked on its second property project. Under a memorandum of agreement signed between Ewein Zenith and CZCSB in January 2016, Ewein Zenith has been granted the sole rights to acquire 50 acres of to-be-reclaimed land at Gurney Drive within a 10-year period for RM2.83 billion. The land will be divided into 10 parcels and will be developed over 10 years accordingly. Ewe says for starters, the group will acquire 5.5 acres out of the total 50 acres from CZCSB to develop its next project, which will have a much larger GDV of RM1.2 billion. Phase 2 of Ewein’s Bandar Tanjong Pinang project will also feature luxury serviced apartments. Ewe says the group has even signed term sheets with an “international hotel brand” to manage the upcoming property. The concept is based on a format similar to the Marriott Residences Penang and Ascott Kuala Lumpur. “The reclamation work is in progress and the land for Phase 2 should be ready by the first quarter of next year, which will allow Ewein Zenith to start work on the project at the end of 2019,” says Ewe. Construction work on the first of three major highways linking the island and the mainland, which is part of the Penang undersea tunnel project, is also expected to start next year. “The second parcel sits opposite Gurney Paragon Mall. If we receive a high take-up rate for the second phase, we can then proceed with the third phase. But we won’t be greedy,” he adds. With a land bank that will keep it busy for the next 10 years, it is not surprising that Ewein has no intention to venture beyond Penang. Ewe says it also has no intention to raise capital on the stock market and will finance the purchase of the 5.5 acres via a combination of internal funds, development profit from City of Dreams and bank borrowings. As at March 31, Ewein’s borrowings totalled RM106.09 million while its cash and cash equivalents stood at RM34.6 million and fixed deposit with licensed bank was at RM30.6 million. It has not all been plain sailing for Ewein, which is seen to be aligned with the DAP-led Penang government due to its partnership with CZCSB — the main contractor of the controversial RM6.3 billion Penang undersea tunnel project. Construction progress on its City of Dreams project stalled in 2016 due to protests from residents of the adjoining Seri Tanjung Pinang property, who filed an appeal to the Penang Appeals Board over concerns about the density and height of the project. As a result, Ewein saw its net profit fall 21% to RM9.07 million last year, from RM11.52 million in FY2016, due to lower progress billings from City of Dreams. Ewe was also not spared. Ewein’s stock took a beating in January after he was remanded by the Malaysian Anti-Corruption Commission (MACC) to facilitate and assist in a graft probe in relation to the undersea tunnel project. Ewe is Ewein’s largest shareholder with a 36.75% stake as at April 6. The dark days of the past year are over. Ewe says Ewein has mostly recovered its reputation. “I understand that the MACC was only doing its job. We (Ewe and CZCSB senior executive director Datuk Zarul Ahmad Mohd Zulkifli) were remanded to assist in the investigation by the MACC after a complaint was lodged by a particular person that Ewein received the 3.67-acre parcel for free and that the Penang government had already transferred the 50 acres to us. “The allegations have been proven false. Ewein is a public listed company. We need to announce to Bursa [Malaysia for any land transactions] and Public Bank Bhd would have evaluated us before they provided us with a term loan financing facility,” explains Ewe. Ewein’s share price has fallen 46% from its peak of RM1.49 on Jan 15, 2016, to close at 81 sen last Friday. Year to date, however, the stock has risen 84% from 44 sen. Its market value stood at RM244.28 million. At the current price, Ewein’s stock is trading at a trailing price-earnings ratio of 12.43 times. Compared with other property stocks, Mah Sing Group Bhd is trading at a PER of 10.39 times, S P Setia Bhd at 13.93 times and UEM Sunrise Bhd at 15.33 times, according to Bloomberg data. While the property development segment has overtaken its traditional business of precision sheet metal fabrication as its biggest profit and revenue contributor, Ewe says it will continue to operate the latter. “This manufacturing segment accounts for 20% of the group’s revenue. For the past 30 years, we have built a good relationship with our customers in 16 countries, including Sony, and we want to maintain that,” he adds. Not wanting to be left behind in the e-commerce wave, Ewein recently entered into a JV with two Thai businessmen to start a coffee-vending machine business in Bangkok. The group will simultaneously expand the business into Malaysia. He expects the profit contribution from the e-commerce segment to one day surpass that of the manufacturing segment.